Rose Hill Plantation is perhaps best known for its equestrian center and weekly polo matches. During the summer months families and friends gather for tailgate parties and an afternoon of polo. Rose Hill also features 27-holes of golf, clubroom, and dining room. Rose Hill Plantation real estate listings and POA fees fall in the moderate price range. The Rose Hill real estate community is is located off of Highway 278 in Bluffton, about six miles from the bridge to Hilton Head Island. The highway divides Rose Hill into what are commonly known as the “golf side” and the “estate side”. Bordering on the pristine Colleton River, Rose Hill Estates is the community’s original development and caters to the equestrian crowd. Large stately homes and lots large enough to accommodate them are the norm. The result is an unparalleled feeling of privacy. For the equestrian, Rose Hill is a dream community. There are 10 miles of riding trails on the estate side as well as an Equestrian Center. In total, 70 acres have been dedicated to this purpose. The river side of the plantation is also home of the Rose Hill Plantation House, one of the few surviving ante-bellum houses outside Savannah and Beaufort. 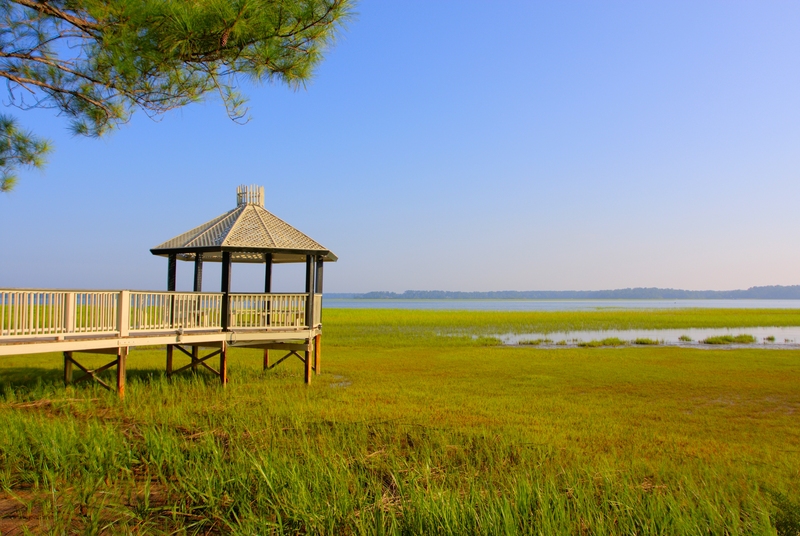 Boating and fishing are available on the Colleton River as is a community dock and swimming pool. There are two sets of tennis courts within the entire plantation with hard-surfaces on this side. Tennis – There are two sets of tennis courts in Rose Hill. Hard surfaced courts are located on the estate side and clay on the country club side. Tournaments are regularly scheduled. Riding – Equestrian center, Polo matches on the polo fields, estate side. Swimming – three pools located in various recreation areas. Marina – small docking facility. Fishing – lagoon, creek and deep water. 1. Rose Hill is home to one of the area’s most notable equestrian centers? Owned by Eddie and Kate Maple, the center offers riding lessons in many disciplines. Hall of Famer, Eddie Maple won numerous trophies during his racing career while riding many well-known horses at multiple tracks and for various owners and trainers. Of note, he rode the famous Secretariat to victory in the 1973 Canadian International. 2. The Rose Hill Mansion, a unique treasure in Southern history, is located within the Rose Hill gates? It is a private residence adjacent to a coastal river that has been restored by the Middleton White Foundation. This timeless structure adds much to the charm of the community. Owners open the home for special events so others may enjoy its beauty and share in its rich history. Rose Hill is a community with 2 major parts. The estate side is an equestrian community that appeals to people who like the ambiance of horses or those who enjoy equestrian activities. It has larger lots and homes that appeal to people of various ages. The other side of Rose Hill provides an opportunity for purchasers to live in a gated community in the Bluffton area which includes some more affordable homes. The owners have purchased the golf course and a management group will be operating them for the plantation.